We reported a case of depression who was noted of increased writing activity in an unusual writing style. And the condition improved dramatically after the prescription of antidepressants and low dose antipsychotics.The handwriting may be one of the most complicated components of human mentality. We consider this report not only intriguing but also instructive. Before this, increased writing activity had been reported in several neuropsychological conditions but never in the status of depression, nor did the correlated treatment having been reported. Our case is the first depressive patients to present this condition and dramatically changed after treatment. We report on the writings of a female with depression before and after she took psychotropics. Mrs. L is a 60-year- old female who denied any major systemic illness. She suffered from body weight loss for six kilograms within a half year but the physical examination showed no major abnormality. She was later transferred to the psychiatric department for further evaluation. Psychiatric evaluation found her symptom of loss of interest, decreased appetite, social withdrew, low self-esteem and even with idea of death. The condition had developed for more than three months and she was impressed of major depressive disorder. She also presented with slow response but without incoherent or irrelevant speech. Considering the suicide risk, admission was arranged and low dose antidepressants were prescribed (selective serotonin reuptake inhibitor, SSRI, Escitalopram 10mg/day). During admission, we found her “diary” written in an unusual style (Figure 1A and 1B). She declared that she had written like this for months with dozens of notebooks production. Electroencephalography and brain image studies (CT and MRI) were than performed with no abnormality. We also evaluated her cognitive function and she gained almost full score (CASI 97/100). Afterwards, we tried to add on low dose antipsychotics (olanzapine 2.5mg/day) for her. She was discharged two weeks later with antidepressants and antipsychotics treatment. She returned to the outpatient department in a month. 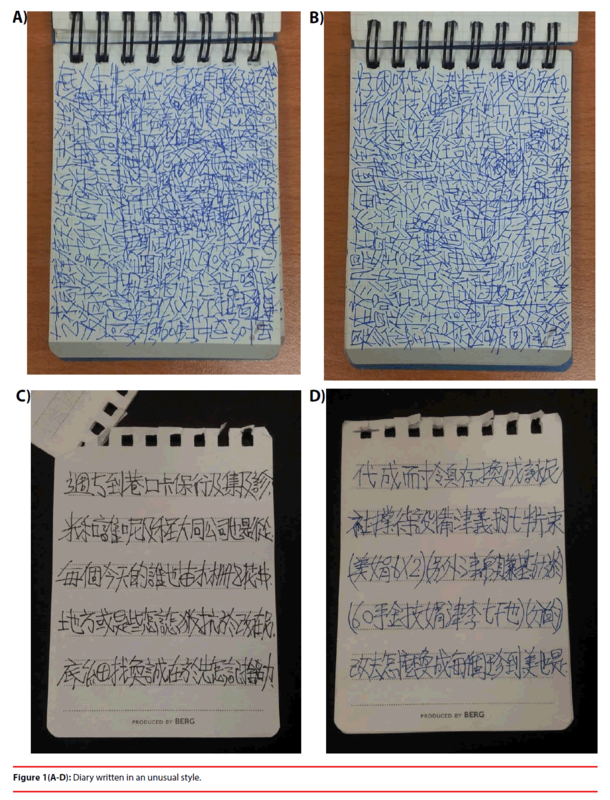 Surprisingly, her writing changed to the “normal” writing pattern (Figure 1C and 1D) and the writing activity also decreased. Figure 1(A-D): Diary written in an unusual style. Because depression is the most frequent psychiatric comorbidity in epilepsy which may mimic primary depressive disorder, the psychiatrists should always remember the possibility of the epilepsy especially when facing the depression with atypical characteristics. Besides, antipsychotics may increase the risk of both epilepsy and stroke, the use of antipsychotics may be more carefully. The cerebral regions and substrates for handwriting are complex. A recent metaanalysis of neuroimaging studies had confirmed the crucial involvement of the left frontal and superior parietal regions in it . At the same time, increased writing activity may be more complex which had been reported in temporal lobe epilepsy , brain tumors , cerebral stroke , or frontal lobe dementia . To the best of our knowledge, our report represents the first case of depressive disorder to present with increased writing activity. One more point worth noticing is that the use of SSRI and anti-dopaminergic drugs changed her unusual writing behavior. There are increasing evidences supporting that not only serotonin and norepinephrine, but also dopamine is correlated with depression . Besides, the mesolimbic dopamine had been proposed to influence idea generation and creative drive which may increase the writing activity . These may provide the possible mechanism why the prescription of antidepressants and antipsychotics changed the unusual writing behavior. Psychotropic targeting on specific neurotransmitter may offer evidence for this and worth further investigation. Planton S, Jucla M, Roux Fe et al. The "handwriting brain": a meta-analysis of neuroimaging studies of motor versus orthographic processes. Cortex 49(10), 2772-2787 (2013). Waxman SG, Geschwind N. Hypergraphia in temporal lobe epilepsy. 1974. Epilepsy. Behav 6(2), 282-291 (2005). Jancar J, Cooke LB. Hypergraphia associated with a brain tumour of the right cerebral hemisphere. J. Neurol. Neurosurg. Psychiatry 55(9), 861 (1992). Carota A, Annoni JM, Combremont P, et al. Hypergraphia, verbal aspontaneity and post-stroke depression secondary to right cyngulate and corpus callosum infarction. J. Neurol 250(4), 508-510 (2003). Frisoni GB, Scuratti A,Bianchetti A, et al. Hypergraphia and brain damage. J .Neurol. Neurosurg. Psychiatry 56(5), 576-577 (1993). Sharma H, Santra S, Dutta A. Triple reuptake inhibitors as potential next-generation antidepressants: a new hope? Future. Med. Chem 7(17), 2385-406 (2015). Flaherty AW. Frontotemporal and dopaminergic control of idea generation and creative drive. J Comp Neurol 493(1), 147-153 (2005).